I wove this chenille shawl using one of the patterns from Marian Powell’s book, 1000(+) Patterns in 4, 6, and 8 Harness Shadow Weave (page 248). 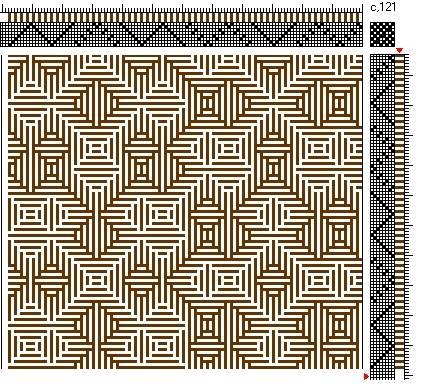 It follows a twill-step sequence and two adjacent blocks weave together in the pattern (unlike the independent blocks in Shadow Weave #2). The book was first published in 1976 by Robin & Russ Handweavers and it’s a precious book, so many patterns done without a computer. 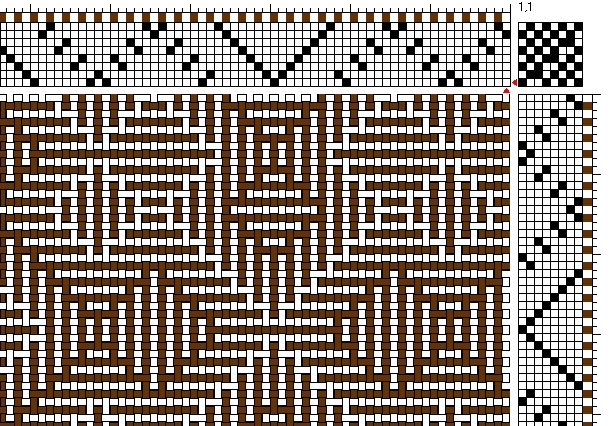 By plugging in the information from the book into my weaving program I created the draft you see here. The horizontal and vertical stripes as well as the outlines of the shapes will appear different depending on whether you start threading/treadling with a light or dark colored thread. 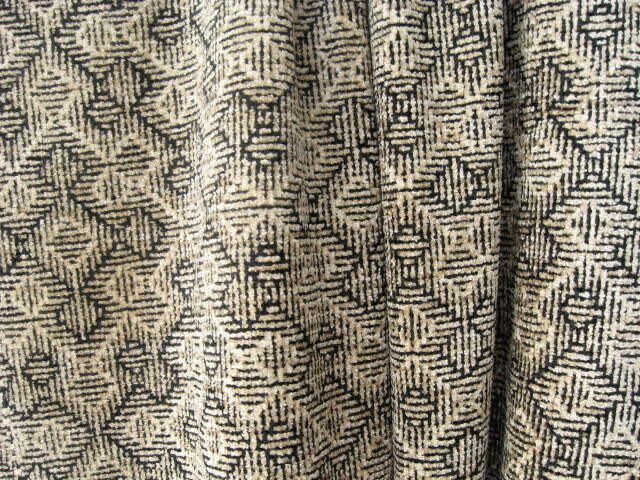 The back of the fabric also appears different than the front. I wove the shawl using rayon chenille at 14 e.p.i. The plain weave structure works well with chenille because you don’t have long floats that would make the chenille get loose and snag. This entry was posted on March 14, 2009 at 1:12 pm and is filed under Color-and-Weave, Shadow Weave. You can subscribe via RSS 2.0 feed to this post's comments. I’ve just been admiring your shadow weave scarf. I, too have used this book for drafts. In your photo it almost seems as if you used 3 colours, yet in the threading and treadling plan there are only 2 – dark and light. Have you ever used 3 colours? This is something I want to try. Hi Gloria, thank you for your comment. I only used 2 colors in this shawl. I think it appears like 3 because the thin stripes of dark and light next to one another appear like a third color. I wove another shawl with this pattern using several colors of 5/2 pearl cotton and if you look at the main photo on my home page the image at the upper right hand corner on top is a close-up of it. 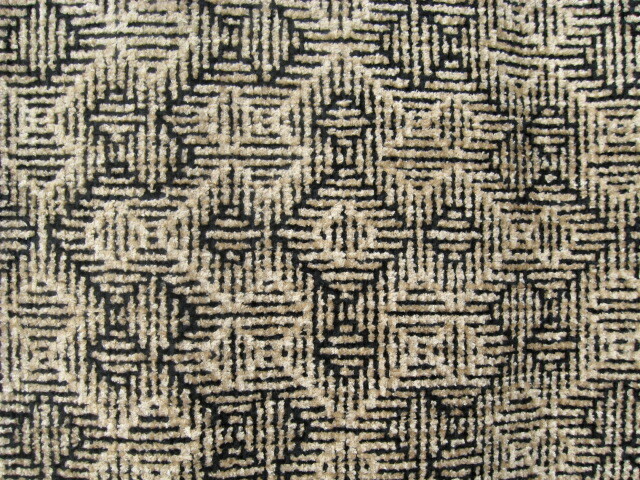 Shadow weave is one of my favorite weaves.